Taking care of dental health with regular dental consultations and maintenance is a responsibility that is often neglected. As the years go by we tend to find our teeth are not the same as they once were, for those who care about the function and appearance of healthy teeth the obvious decision is to seek professional dental treatment. Due to the current economic crisis and the increasing cost of health and dental care in most Western European countries, an increasing amount of people have discovered the benefits of traveling to phuket for their dental consultations, cheaper implants and high quality cosmetic dentistry abroad. 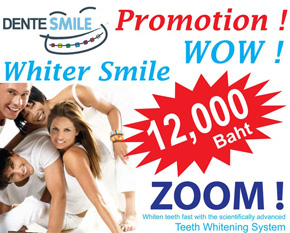 You can also check our dental prices in phuket and for occasianlly dental treatments we also set up more affordable prices at our dental clinic in phuket. Compared with UK prices you will notice there are significant savings in both cases. For further information read our step by step guideline. 1. The first step to booking a dental consultation is to send us an email with all the necessary dental information regarding your current overall health and the health of your teeth. Please mention which teeth in particular you would like treated. For your convenience, you can complete the form available on our website. 2. If you have current the teeth photo, dental x-rays, please include them in an attachment as they will give us a better understanding of your dental health. Once we have analysed the information, we will contact you to advise you on the best options for addressing your dental problems. 3. A comprehensive dental treatment plan and estimated pricing will be sent to you. You can also check our dental price list here. 4. If the treatment times chosen do not work with your current schedule, please notify us so that we may select a more convenient treatment time. 5. We go out of our way to make your stay in phuket as pleasant as possible. In addition to providing you with quality dental treatment, we can also send you information on nearby accommodations, making it easier for you to coordinate your visit with us. 6. If you find accommodations that suit you, we will be happy to make the necessary reservations on your behalf. 7. The final step is to book your airline ticket and confirm your reservation so that we know when you will arrive. One of our delegates will greet you at the airport, and will be at your disposal throughout your entire visit in phuket. We look forward to offering you dental treatment of the highest standard in our new state of the DENTESMILE DENTAL CLINIC.